“Just relax.” Is there a more infuriating statement on the planet? We love our friends & family, but we’ve all had times when these close relationships can test our patience. Maybe you are admittedly a bit of a type-A over-achiever and despite collecting a stack of self-help books on your nightstand, still find yourself trying to do it all. You can probably easily identify if you are feeling stressed by scanning your body for clues- your chest is constricted, your shoulders tensed, maybe there is an anxious feeling residing in your gut. Why does your body respond physically to a stressful situation that doesn’t require you to jump up and take action, let’s say being stuck in traffic when you are running late to catch a flight? We are pretty intelligent beings, but the stress response is at such a primal level, that it bypasses the conscious decision making process. How primal? The sympathetic nervous system which activates the stress response is part of the autonomic nervous system which is in charge of making sure we breath, digest, eliminate and circulate blood without putting a whole lot of thought into it. When your body senses a threat, it goes on the defense. The adrenal gland fires up and releases a cascade of hormones to communicate with the body through the autonomic nervous system and prepare it to respond. What does this look like? Just like you might expect to feel if approached by a snaggle-toothed hippo along the banks of the Nile. The body’s vital resources and energy are directed towards the organs that could save your life (i.e. muscles are primed for action vs digesting your last meal is put on the backburner). Except in modern times, we don’t have the occasional wild animal encounter to be on alert for – we have perceived threats coming at us all day long, from waking up to a full inbox, learning about a terrorist attack on the morning news, dealing with bad drivers on the morning commute – we could easily be in fight-or-flight mode by the time we even arrive at the office. Although this kind of stress can be a headache cause in itself, the real problem occurs when we get stuck in this mode. 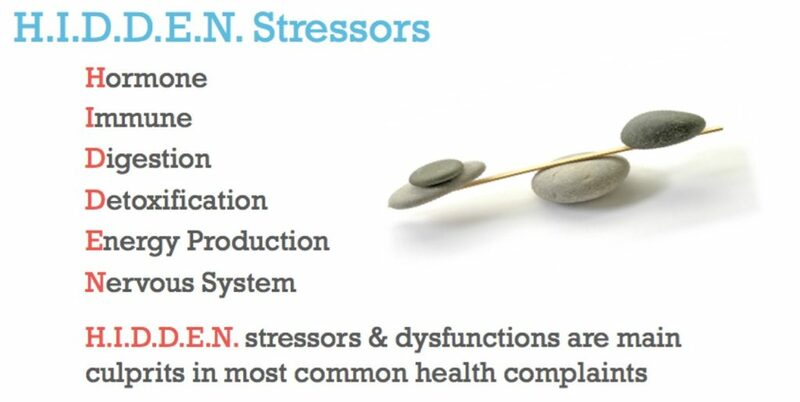 We are designed to handle acute stress pretty efficiently. Our sympathetic nervous system knows how to ramp up into “fight or flight mode” and then we have the parasympathetic nervous system to kick us back into “rest or digest” after the threat is gone. When this respond & relax cycle is working well, we are in “homeostasis” – basically functioning as we should. Chronic, ongoing stress becomes an issue because we never get a chance to relax and recover and over time the body’s resources can be depleted. Chronic stress can take an obvious form such as a daily, stressful interaction with a coworker or family member, or be much less obvious like a viral infection simmering under the radar. By the time someone experiences the symptoms of chronic stress (chronic headaches, digestive complaints, skin rashes, etc), there are usually many layers of stress piled on their shoulders all at the same time. Is all stress bad? Life would be pretty boring without challenges and “good stress”, things we call Eustress. And realistically there are going to negative or unexpected stressors as well. The key is to build up resilience and our capacity to manage internal stressors so that we can handle the every-day life stress that are sure to come along. If I ask you, “what kind of stress do you have going on in your life right now,” what comes to mind? A big project with a fast-approaching deadline? A mother-in-law who is coming to visit this weekend? Maybe you are planning for a big dream vacation and just nervous that everything will go as smoothly as you hoped. All of these are real stressors and potential headache causes, but they are not the only type of stress that we put on our bodies. In-fact it is just one of three categories that I help someone examine when they are working to reduce stress in their life. The examples above are all examples of mental-emotional stress… situations or interactions that we perceive as stressful. 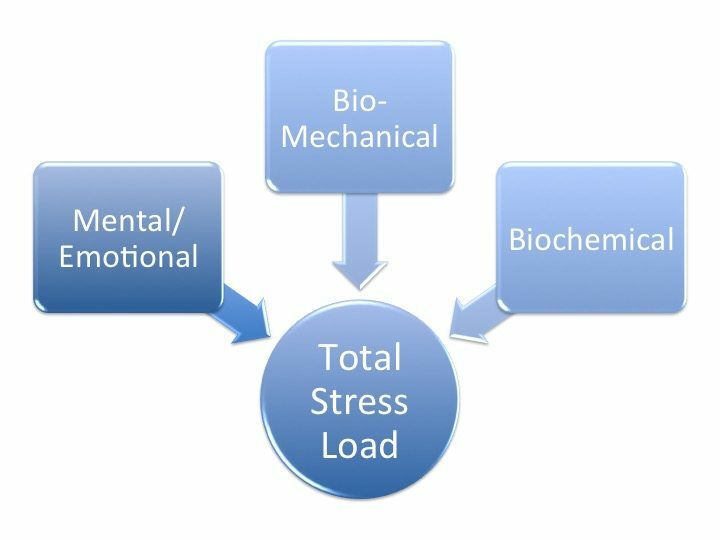 The next category is biomechanical stress, for example if you experienced a trauma such as a car accident, that left you with an injury or misalignment… your nervous system treats this like one more stressor on the pile. The third category, the one that functional nutritionists specialize in, is biochemical stress. What are examples of biochemical stress?? A true investigation into reducing stress will address both H.I.D.D.E.N. internal stress and external stress and give you tools to manage all three categories and find headache relief. Read more about the H.I.D.D.E.N. stressors in the next section. Did you ever imagine that on top of external stress like feeling overcommitted, being stuck in traffic or dealing with a particularly dense coworker, you could have internal stress, too?? Internal stressors like a parasite, for example, can be a huge contributor to our overall stress load and a really significant headache cause, because the parasites are constantly (chronically) triggering a stress response. Having one more or more internal stressors can make it harder to cope with external stressors, because we are always living closer to our stress threshold and more susceptible to symptoms like tension headaches, mood changes or an upset tummy. I call these hidden stressors because they aren’t always obvious to us. Many people have parasites for decades with no obvious digestive symptoms after being exposed during travel, contact with pets or undercooked foods. Certified Functional Diagnostic Nutrition® practitioners specialize in helping you identify these hidden stressors and the underlying malfunctions that are causing them, and then build a plan to restore vitality and healthy! I specifically work with people to find the most common underlying factors that cause headaches and find that by removing these internal factors, my clients become much more resilient to other day-to-day stress and headache causes. Curious if H.I.D.D.E.N. stressors are holding you back from feeling radiant? Schedule your first consultation and we can find out if eliminating underlying stress could be your secret to natural headache relief.